My daughter's laptop running Win8.1x64 connects to a 3TB Seagate Backup Plus external USB drive where she likes to keep her photos. Recently, she told me the drive wasn't working. So last night I took a look, and it didn't seem to power up. I took it apart, took the 3TB HD out and put it in an external enclosure (USB2/e-sata) I have and powered it up on my Win 8.1x64 PC. Windows sees the drive but wants to format it. The file system shows as RAW. Early on, I get conflicting info. However, running Testdisk 7, it only seems to show as 375GB/349GB and the note at the bottom seems to indicate recovery will be unsuccessful unless the capacity is correctly detected. Last edited by speedlever on 28 Aug 2015, 15:05, edited 1 time in total. On your display above, you should select Disk / dev/sdd. Confirm through until you see Analyse, press enter and upload another snapshot, so that I'd be able to check your current partition structure (partition table). If it seems ok, you can run a boot sector diagnose. Info and steps will follow. In some cases, especially WD-disks caused some trouble to recover data after removing a disk out of its enclosure. With Seagate, until yet, I've not seen such problems. Thanks for the reply Fiona. I think the 3TB drive you refer to is the wrong one. I have 2 of them connected. One is the Z:\ drive which shows. The f:\ drive is the one in question. Note above how it only shows 375GB below, but no corresponding entry above. I have no idea what the 801GB/746GB drive is referring to. My 3TB Z:\ drive is currently using 508GB of space. I've tried Recuva (with no success). Same with Asoftech data recovery. Neither of them see the F:\ drive. Windows sees it fine, but can't read the RAW file system. Let me try this first: I'll disconnect my good 3TB drive and see what Testdisk sees then. I'll report back when I have a chance to check that. Would it be possible that your disk capacity is not recognized correctly? Most important would be your disk capacity and not Drive! 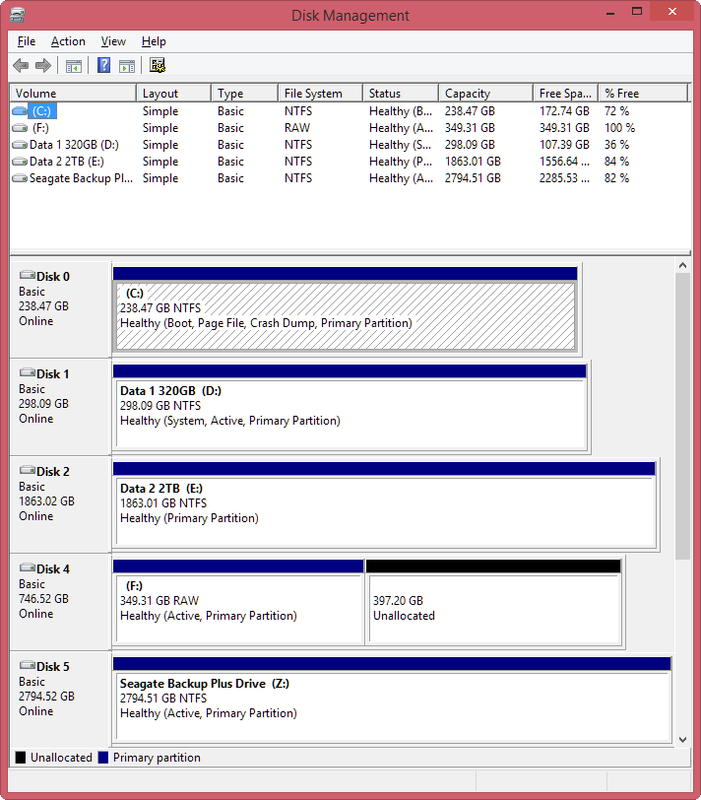 Drive might be a partition only? 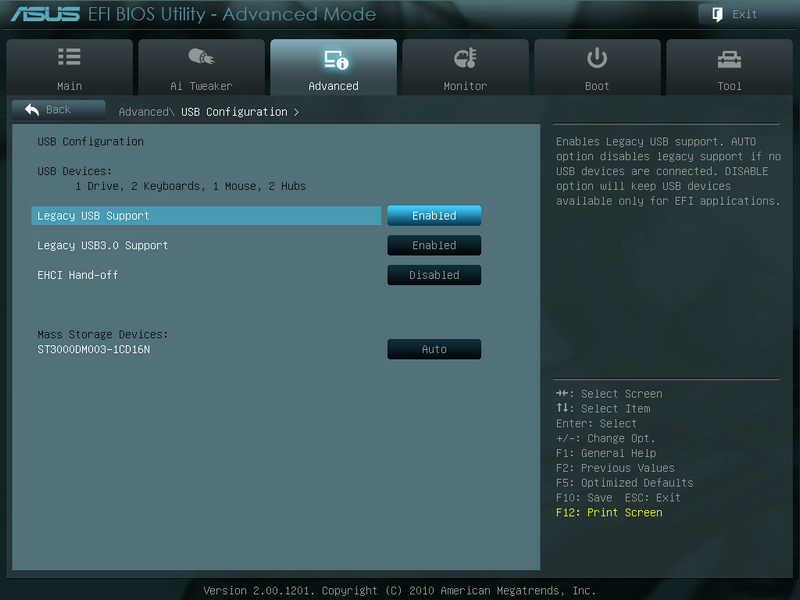 In case you should check cable and how is your disk listed in your BIOS/UEFI too. In some cases, hdat2 could probably help? But before you use such utilities, you should exclude any other reason. 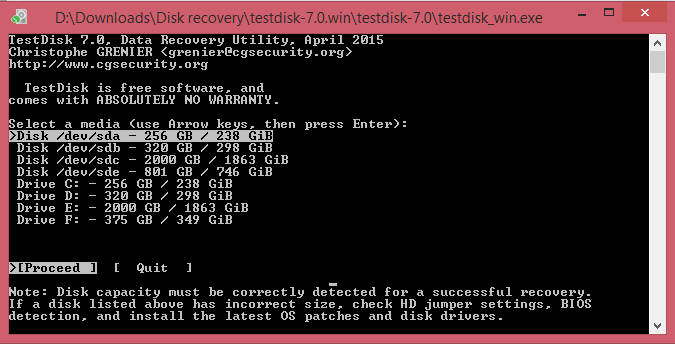 After getting disk capacity back and you still experience some problems, you can use TestDisk. Here's a screen shot after disconnecting my Z:\ drive (my own 3TB Seagate Backup drive). Looks to me like Testdiskv7 is not seeing the problematic F:\ drive except in the bottom part of the display. Not in the Disk /dev/sbx list. I don't see how drive f:\ relates to anything in the Disk /dev list, unless it's the 801 GB/746 GiB item.. which is the wrong capacity. What am I missing? Ok, let me reboot and check my BIOS and see what it's showing. Here's a shot from my UEFI screen. It only shows the defective F:\ drive, instead of both my good Z:\ drive and the faulty F:\ drive (based on the name of the drive). Backup + Desk is my Z:\ drive (USB 3.0 connected Backup Plus). The problematic F:\ drive is connected via USB 2.0 (I have e-sata available, if that might make a difference, but otherwise, my enclosure is either USB 2.0 or e-sata). I suspect the USB 3 drivers aren't loaded yet preventing my Z:\ drive from showing in UEFI. UEFI doesn't provide any info about the disk capacity. Would it be possible that your disk is recognized with 801 GB only? 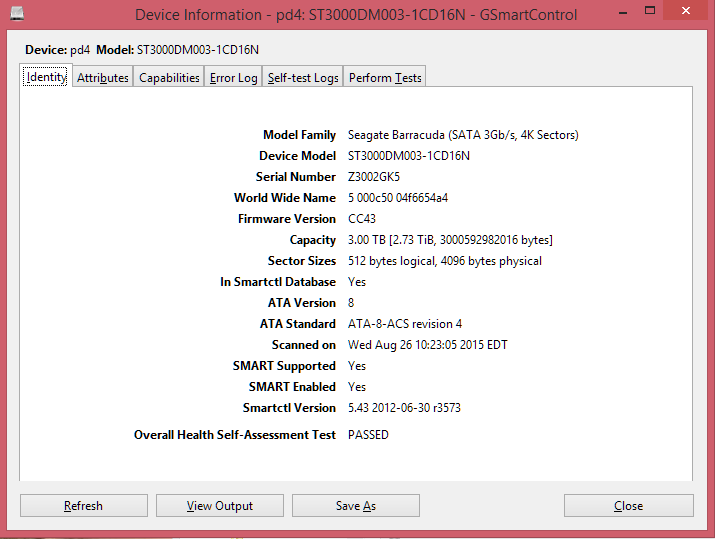 Before you run any utilities like hdat2, you should run the diagnostic utility from the manufacturer. Also check Intel Rapid Storage Utility. Please check the disk capacity in your disk mamagement console too. Fiona wrote: UEFI doesn't provide any info about the disk capacity. 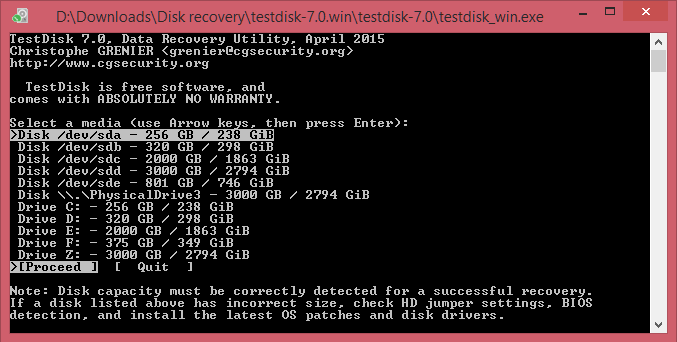 As you can see from the image below, Disk Mgmt shows the problem F:\ drive (Disk 4) with the incorrect capacity. It was (is?) a 3TB drive before it became RAW. 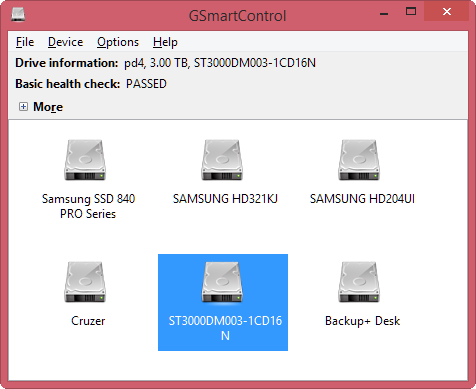 My own Z:\ drive (Disk 5) is also a 3TB Seagate Backup Plus drive and shows appropriately. Ergo, I don't believe it is a driver issue, unless I misunderstand what you are saying. The problem drive is the one at the top of the list. But they both pass the short DST test and both have the same firmware revision. The drive passes the SeaTools SMART check too.